It will be officially launched on 26 April at a gala dinner in the Great Hall at Hogwarts in the Harry Potter Experience just north of Watford. It’s been a humbling experience to hear from so many people at first hand how the Trust has changed their lives in some way or other. Together with a team of volunteers we have delved into archives of programmes, local and national newspapers and we have interviewed more than 70 people – I’ve done more than 40 myself. 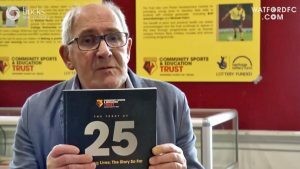 The project which includes a website, an exhibition which has been at Watford Museum during March and the book mostly funded by a grant from the Heritage Lottery Fund. And as one job comes to an end another starts. Following our development of a website for Alan Skidmore and the contribution of regular blogs, we’ve been asked to build a site for fellow jazz musician Anthony Kerr. We’ve shot some video clips in his studio which will form a key part of the site which should be up by the end of May.